When Sharon Morden was unable to provide her usual cake – custom-iced with the play’s poster – for Tipling Stage Company’s recent production of Murder Mistaken, the innovative theatre group decided it was time to show some support for her Feral Cat Rescue program. 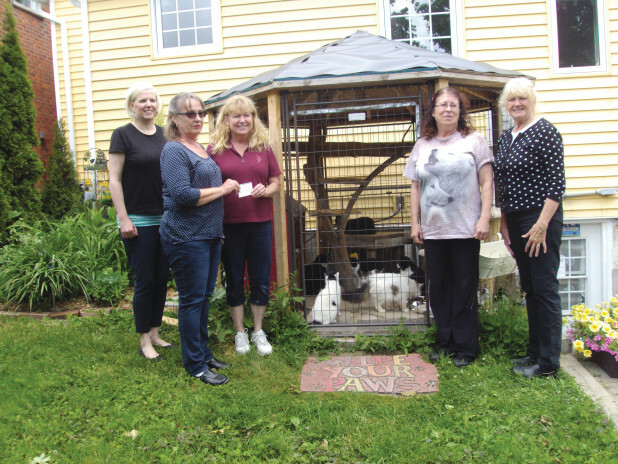 It was agreed to donate all the proceeds from the concession, which the company runs at intermission during the five days of its productions, to help with the expenses Sharon and her volunteers encounter in looking after Shelburne and area homeless cats. The mission of the Feral Cat Rescue program is chiefly to humanely trap, neuter and return feral cats that reside in barns, towns and in other places on rural properties. Dropping by to present the cheque to Sharon, Tipling Stage President Jane Turnbull, was given a tour of the sanctuary as the cats – currently 28 of them – were being fed and was impressed with the premises and the enthusiastic volunteers. The non-profit Feral Cat Rescue operates entirely on donations from individuals. Donations of food, litter and cat related supplies are always welcomed as well as the donation of volunteer time. Tipling Stage Company, Shelburne’s community theatre, is also a non-profit, volunteer-run organization operating out of Grace Tipling Hall where is produces three plays a year.